Maricopa county (encompassing the Phoenix/Scottsdale area in Arizona) made it a priority to preserve a portion of its natural desert as open space. With this in mind, planning began in 2000 on an ambitious project of connecting the 10 regional parks with a non-motorized trail system. Once completed (in cooperation with Federal, State and local agencies), this Maricopa Regional Trail System will be one big loop around the County, encompassing approximately 250 miles of trails for hikers, bikers, and horseback riders. On a northwest corner of these trails, for 7 miles we went Tritty Trot Tuddle Dunking (Clydea's term for a trotting training ride!) through the Sonoran Desert amongst the saguaro and cholla, rabbits and Phainopeplas and a coyote, sharing the trail with hikers and a biker on this cool winter day. 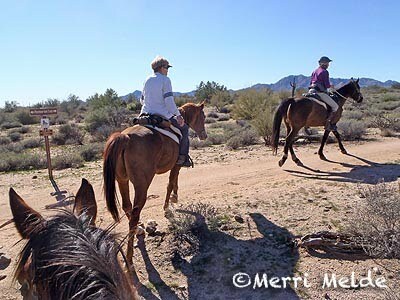 If we wanted to, we could have ridden all the way to McDowell Mountain Park, where one of the Lead Follow Or Get Out Of My Way endurance rides is held. Maybe one day, some adventurous ride manager will put together a 100-mile point-to-point endurance ride on this trail system, which should, of course, be called the Maricopa Tritty Trot Tuttle Dunk. You're flirting with disaster when, if you're a #WinterWimp, you migrate south with two horses and me, the Ice Princess, hoping for a warm winter in Arizona and California. "Trona is known for its isolation and desolation," says Wikipedia, and that about sums it up. Either blinding white (even in winter!) from the borax crystals mined in the dry alkaline Searles Lake bed, or Desolation Gray (a crayon color yet to be invented) from the severe and sparse mountains and desert, and freaking hot in the summer (think 105* average for July), regular godawful wind, and chronic stink from the "hellish stench of sulfur" (said the L.A Times in this dismal 2006 article), Trona appears to leave much to be desired. It's slightly famous for the nearby Trona Pinnacles, where, among others, Planet of the Apes, and Star Trek V movies were filmed. for all 4 days gave us a grand view and sniff to the east of the Searles Valley, Trona, and the borax plants. While in previous years the DVE would traverse some trails of the actual Death Valley National park, now because of logistics, permits, and a morphing endurance riding population that isn't as gung ho as they were in the old days and which prefers not having to pack up and move camp every night after each day of riding 50 miles a day, the DVE ride is still pretty darn close enough to Death Valley, and still has some of the most scenic trails I've ever ridden on an endurance ride. To the West lies the Slate Range, Panamint Valley, Panamint Mountains, and Death Valley, in that rugged order. The area is rife with history: of the Timbisha Shoshone, Western Shoshone, and Paiute Native Americans around before the gold and silver miners who attracted the pioneers (memorably the Lost Fortyniners) who came to look for more gold. Old mines and equipment still litter the landscape over the trails we trod during the endurance ride. Steph and I rode Smokey and Jose on the 50-mile rides on Days 1 and 3. We had inch-thick ice on the water buckets in the mornings; we wore layers of clothing (Steph 6 layers, me, The Ice Princess, 3 layers, and the horses their thick Idaho winter coats) to start out. Not much got peeled off during the days! Day 1 followed two-track desert roads, washes, burro trails (we didn't see any burros, but they were around, but what the heck they ate to survive I couldn't imagine), climbing up and over the Slate Range and down into the Panamint Valley, before following miles of the dry Lake Panamint bed, then climbing back up and over the Slate Range again to basecamp. Most of the trails were rocky. But we expected that, having padded our horses' feet. Climbing up and over the Slate Range got our winter-hairy ponies quite sweaty despite the awesome temperature (says the Ice Princess) of high 30's in the morning sun. The view of the Panamint Range across the Panamint Valley far below is staggering. In the winter sun, the rippled washes grooving the mountains in tans and grays and purples are magnetic and mysterious to the eye and soul. Lunch was a pleasant stop in the middle of the Panamint Valley. I had the best cup of soup I've ever had in my life which I slurped and crunched down even before the noodles softened. In this country, you trot when you can when the footing's good, and you walk when you have to when it's rocky. We had good footing along the dry Panamint Lake bed heading back after the lunch stop, and we trotted, non-stop for 1 hour and 20 minutes. The playa is a dry mud flat covered with water in the wet season - if there is a wet season. 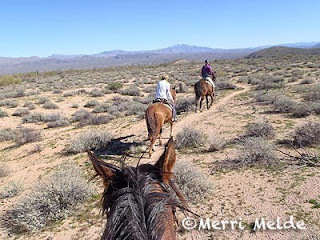 We had a slight head breeze and the horses cruised along this soft, rock-less footing. Once we turned back toward the Slate Range, the horses got back to picking their footing through rock, rock, and more rock. The trails we climbed back up were built by a dirt bike group - 4 miles of it, at least. Tremendous effort they put in, and they must have been some C-R-A-Z-Y riders. Yeah, I'd ride a sure-footed horse over these trails, but a dirt bike!? Those people are nuts. But we appreciated the trails, with yet another spectacular view of the Panamint Valley and Range behind us that widened into a spectacular panorama far below us. The trails and two-track roads down the east side weren't as steep nor as rocky. I got off to walk/run some downhill, guaranteeing I'd be wiped out by the end of the day. While still up high, (un-forecast) clouds began moving in and the temperature dropped to the low 30's, and danged if we didn't get a few itty bitty snowflakes on us as we were riding into the finish. The Ice Princess' power extends even to the southern reaches of Death Valley! We'd planned on riding our horses only 2 days, so we decided to ride Day 3 (up the Slate Range again), and sleep in on Day 2! Day 3's loop 1 took us back up into the Slate Range on a different trail - and up and up, climbing to radio towers on one of the peaks. We had yet another view of the Panamint Range and Valley as we headed up. Descent back to the Searles Valley was a long, steep, gnarly, very cool old trail that must have first been created by burros. Everybody was off leading on foot on that one. That is a trail you would not want to ride up! then across the highway to the Argus Range foothills - but no matter which way we rode, we always had a clear view of Ridecamp far away. The horses sure kept their eyes on it the whole afternoon! Every time we seemed to be getting closer to it, we'd keep traveling in the same direction way past it. We rode up to a water-less waterfall in the Argus foothills and made some more wide detours in numerous directions before finally finishing, just as the sun sank behind the Argus range and the temperature began dropping again. Cindy Bradley and her Morgan, Bogar Tucker, (aka "Bo", with over 5000 miles) accomplished Decade Team status after Day 1's 50 mile ride. Becky Lange's Kentucky Mountain horse, Mocha Jack, (aka "M"), reached his 5000 miles plateau. Attendance was again lower than the year before… we sure hope The Duck keeps this ride (and the rest of his XP rides) going. We made some new friends, reconnected with old friends, played some old tyme Bluegrass music at the New Year's Eve party with Gretchen (and on an earlier day, Simon), and loaded up and said, (as did one of the Lost Fortyniners, as the story goes), "Goodbye, Death Valley."